Wolfe Outfitters is a full-service outfitter offering guided fly fishing and conventional gear fishing trip services, and access to premier fishing waters. 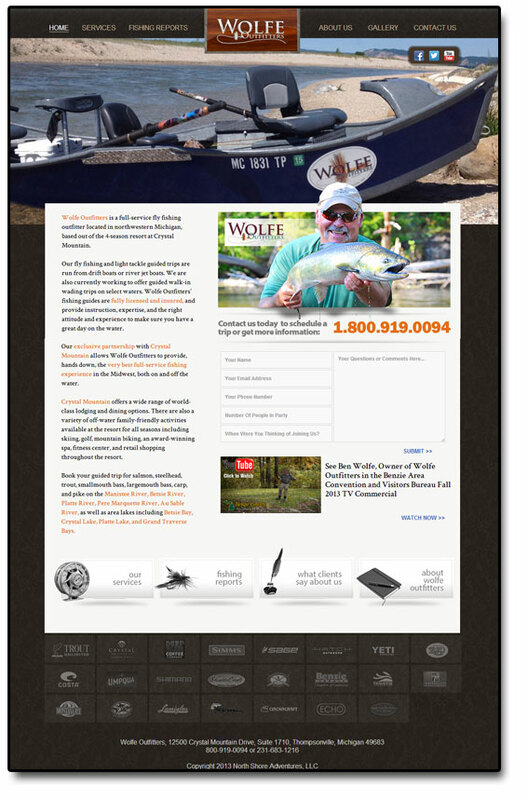 Wolfe Outfitters customers enjoy personalized fishing trips tailored to their preferences. Expert guides, utilizing extensive knowledge of Michigan’s prime fishing opportunities, are dedicated to providing customers with unforgettable fishing experiences. Customers are welcome to bring their own gear or utilize top-of-the-line equipment furnished for their trip by Wolfe Outfitters at no additional charge. The guide staff of Wolfe Outfitters are fully licensed and insured. Whether a customer is new to fishing, or a seasoned angler, their guide will provide the right amount of assistance and instruction to ensure a great day of fishing. Wolfe Outfitters has both State and the highly sought-after Federal permits to fish the prime waters within the Huron Manistee National Forest. Wolfe Outfitters is also the only permitted Outfitter to operate in the Sleeping Bear Dunes National Lakeshore, fishing the world-class Platte Bay.